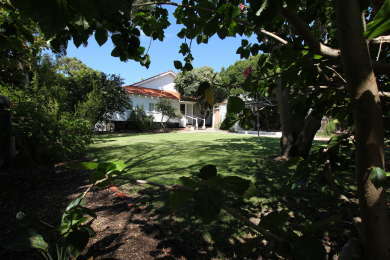 John and Elsie Curtin built their home near the sea in Cottesloe, Western Australia, in 1923. Members of their family occupied it until 1998, when it was sold to the Australian and Western Australian governments. In 2002 the property was vested in the National Trust of Australia (WA). This was the home to which, as a federal parliamentarian elected in 1928, as Leader of the Opposition from 1935, and as Prime Minister of Australia from October 1941, John Curtin returned thankfully whenever he could. ‘My greatest happiness’, he wrote to Elsie in 1938, ‘is when I am at home with you’. In 1917 John Curtin moved to Perth from Melbourne to edit the Westralian Worker and Elsie left her family home in Hobart to join him. They were married a week after her arrival. Although John had little leisure time, they wanted to live close to the ocean and rented a weatherboard house in Napier Street, Cottesloe. Their daughter Elsie Milda was born in 1917. In 1919 John suffered a severe bout of nervous exhaustion from overwork and emotional strain. Elsie’s parents Abraham and Annie Needham, who always enjoyed affectionate relations with their daughter and son-in-law, sold their home in Hobart and moved in with the Curtins to support them. After John Francis Curtin was born in 1921, the extended family purchased a larger house down the road. Early in 1923 the Curtins bought a block in nearby Jarrad Street where a local builder constructed the new brick and tile house that would be home to four generations of their family. Annie Needham, who had been widowed in 1922, lived with them there for over 20 years. The new house originally consisted of an entrance hall and passage leading into four rooms. It was surrounded on three sides by verandahs. The bathroom was tucked into a corner of the back verandah. There was a wood-fired copper in an unlined weatherboard washhouse behind the house and the wood shed was on the back fence. The pan toilet was also on the rear boundary. The front door opened onto the side verandah. Family members recall that Curtin planned to walk the verandahs while practising his speeches during wet weather. This space soon disappeared as family needs encroached. In 1924 the northern (back) verandah was fully enclosed to provide a small dining room— eventually a bedroom for Grandma— and a kitchen. The former kitchen and dining rooms became a children’s bedroom and a lounge room respectively. 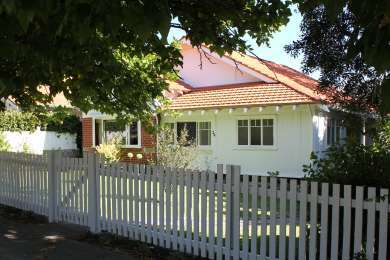 In following years Grandma’s former bedroom served as a dining room, the last corner of the verandah was enclosed to make a sleep-out for young John, and the lounge room was extended forward into the former front verandah. The toilet was connected to a public sewer by the late 1930s. Although John Curtin had no local electoral office, he was highly accessible when he was at home. He was a familiar figure as he took walks to the beach and Cottesloe’s other open spaces with his friend Kip, the family’s kelpie. He could be seen at meetings, at the local billiard saloon, at the barber, and on local buses and trains. His home telephone number and address were publicly listed. His constituents had only to open a low picket gate, follow the garden path to the Curtins’ front door and ring the bell. A member of the family would answer the door. Curtin received these visits in the lounge room. The telephone was in the hall, close to the dining room. Calls were incessant and often about local electoral business. From late 1941, when John became prime minister and Japan entered the war, the days he spent in Western Australia were reduced to fifteen per cent, or less, of his average from 1937 to 1939. Elsie’s presence in his electorate was essential. She was prominent in the Labor Women’s Organisation and the Women’s Service Guild. Often working at the family dinner table until midnight, she had long handled local mail and calls from electors in Curtin’s absence, and collected newspaper cuttings of political interest. Now, the port of Fremantle—which was in Curtin’s seat of Fremantle—was a strategic enemy target close to Cottesloe. Families were separated as children were evacuated and adults engaged in war service away from their homes. More than ever Elsie and John believed their home, and her ongoing residence there, was central to sharing in these deprivations and serving his electorate. The house is still much as it was in the interwar years. After John Curtin’s death in 1945 Elsie, while continuing to live there until she died in 1975, gave the house to her daughter Elsie. The younger Elsie and her husband brought up their daughter there, and Elsie later lived there alone. Few modifications were made after the war. Dark wooden interior fittings, including skirting boards, architraves and bathroom and hall cupboards, remain. 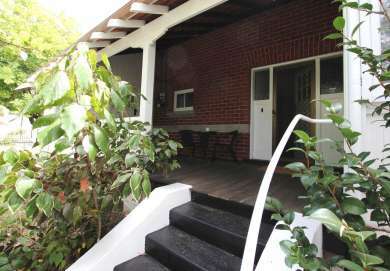 However, a remnant of the front verandah was enclosed, the dining room was extended onto the eastern verandah, and an inside toilet and new fittings were added to the bathroom. The wire washing line strung between poles and supported with clothes props was replaced with that icon of 1950s-60s Australian suburbia, the Hill’s Hoist. A double asbestos garage was built on the rear boundary. The Curtins did not own a car in John Curtin’s lifetime: they chose to live close to shops, buses and trains, and all of the family commonly used public transport. A well-loved armchair, which Westralian Worker colleagues presented to Curtin as he entered parliament early in 1929, was used in the lounge room until the house was sold. Together with other objects in the Trust’s collection, it attests to the family’s modest lifestyle. The house and its location were always a solace to Curtin. They removed him from the heat and intimacy of Labour Movement tensions in other states early in his career, sheltered a teetotal household of Elsie’s creation in which to manage his sometime alcohol dependency, and offered him escape from his mood swings and despondency in peaceful walks nearby. His personal capacity aside, it may well be said that they made him electable as a leader of the Australian Labor Party and as an Australian prime minister.